Kids will love being in charge of their very own food truck and enjoy attempting to deliver a five-course meal. Frankie's Food Truck Fiasco get kids to match shapes and gets them familiar with following rules and playing with other kids. 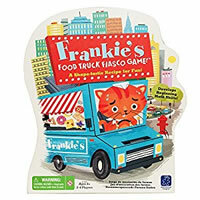 Frankie's Food Truck Fiasco is intended for smaller kids ages four years and up. The fun theme of this game will get kids excited and they will want to play over and over. Players will forget that this is an educational game and will just have fun playing. Glance through the rules below to see how to play. Pick up your copy of Frankie's Food Truck Fiasco today. Be the first to deliver a five-course meal and you'll be the winner. Inside your box you'll see a colorful game board, 1 Frankie squeezer, 20 food game pieces, 4 placemat player boards, 1 game spinner and the official Frankie's Food Truck Fiasco game rules and instructions. Please keep in mind that the official Frankie's Food Truck Fiasco childrens rules and instructions could be different depending on the game version you have. The rules below are some of the exact directions on how to play Frankie's Food Truck Fiasco. Share with us your comments, funny stories, tips, advice, strategies, creative ways to play, questions about how to play, problems with the rules or anything you want about Frankie's Food Truck Fiasco. All submissions will be reviewed within 24 hours. Click here to add your Frankie's Food Truck Fiasco comments.